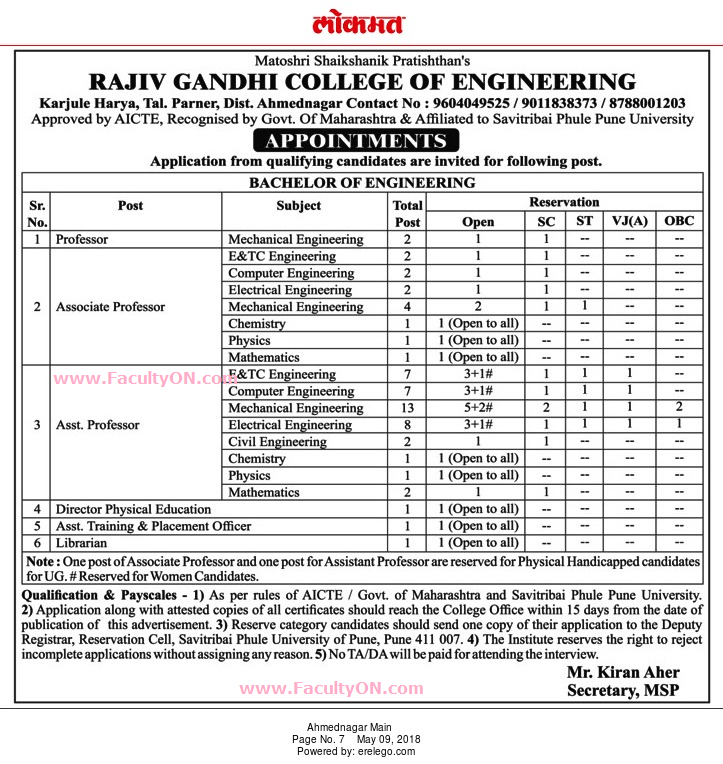 Rajiv Gandhi College of Engineering, Ahmednagar has advertised in the LOKMAT newspaper for recruitment of Professor / Associate Professor / Assistant Professor Plus Non-Faculty jobs vacancies. Interested and eligible job aspirants are requested to apply within 15 days from 9th May 2018. Check out further more details below. About College: The rapid progress made by our country in the field of science and technology has given rise to phenomenal demand for qualified engineers in all areas and to cope up the demand, there has been a surge in institution's offering engineering. Rajiv Gandhi College of Engineering & Polytehnic - RGCOE is established in the year 2012, with a vision to create Engineers having the drive, skill and confidence to become the pioneers of tomorrow. How to Apply: Interested and eligible candidates are requested to send application along with attested copies of certificates / testimonials and recent PP size photos to postal address provided here.